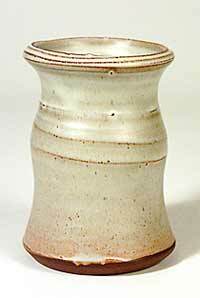 Pollex pot - 3¾" (95 mm) high. John Pollex trained at Harrow College of Art and later worked as an assistant to Colin Pearson at Aylesford. Originally best known for his traditional slip decorated pieces, his style has changed over the years, and he is now producing brightly coloured work of a much more exotic nature. He enjoys taking part in potters' workshops, and has featured in many of these in recent years.